Ever wonder how well companies are performing, esp if you don’t have access to their financials? One big clue is the organic social media chatter being discussed about them, which we refer to as a component called mindshare. The above graphic (upper right is best) shows how AirBnb has far more chatter about its brand over traditional travel websites, with mostly adoring comments pushing it to the upper right. Data supplied by NetBase (an Altimeter client), who crunches unstructured social content into insight and analytics. AirBnb unique experience of other people’s homes poses threat to traditional hotels. The below selected quotes, also provided by NetBase shows the preference for both the unique website experience, as well as the unique listings beyond traditional hotels. Select tweets below that helped to derive the data, show how consumers are finding pleasure in unique AirBnb experience, and some having better quality experiences as people become like hotels. What makes AirBnb so unique? They’ve already integrate Facebook social graph, which allows you to see which one of your friends has stayed, or is a host, increasing trust. Secondly, they’re very unique local neighborhood breakdown, such as this one of SF’s Mission district sets them apart as an experiential travel site. Traditional travel sites lumped in neutral land. Perhaps a marketing executives biggest challenge is trying to segment themselves from similar competitors –the cost of marketing rises to be unique. The traditional travel websites like Expedia, Travelocity, Priceline, and Hotwire battle it out in no man’s land, in neutral sentiment. Because they’re tightly grouped together with mostly neutral sentiment it means they’ll have to spend even more on marketing to differentiate –or make radical product changes to stand apart from the pack. 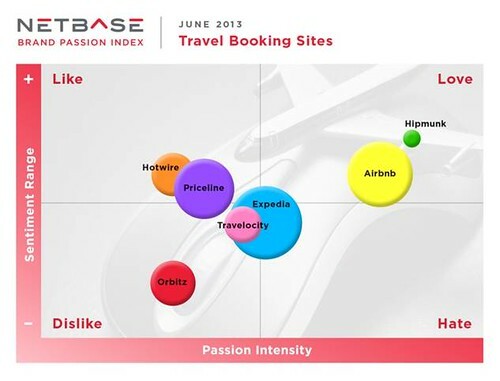 Expedia which has the most discussion in the space straddles further into negative sentiment, while Travelocity has far less discussion –and most it in the negative sentiment. Outliers Orbitz and Hipmunk hold unique market opportunities. For some marketers, being in a unique position, even with negative sentiment is a greater opportunity. Orbitz, while disliked by organic social media sentiment offers a upside for a company like Orbitz is they have the rare opportunity to tell a comeback story –bypassing the four in the middle. Three year old new player Hipmunk, while has a small amount of market chatter has an overwhelming positive sentiment as they aggregate and simply travel listings. Hipmunk’s opportunity is to get their already happy customers to evangelize on their behalf, stealing market chatter from traditional players. The Sharing Revolution is Rising –Corporations Must Develop a Strategy. Traditional businesses (esp stagnant ones) must develop collaborative economy strategy –or risk disruption from new sharing startups. While this is only a look at one sector, hospitality and travel I look forward to exposing more of the data in this space, while hotels and cars were first to be disrupted, but if you’re in a traditional corporation, you must pay attention to the sharing revolution, which will impact all verticals. Altimeter is publishing an open research report on the Collaborative Economy on June 4th, 2013, focused on how corporations can be relevant with the sharing revolution. Below: Select tweets provided by NetBase that illustrate the preference for AirBnb over traditional hospitality and travel websites.